I first encountered it almost 15 years ago when I took a small boat across from Arnisdale to Barisdale to walk a few peaks. We ended up bivvying in a cave because the Barisdale Bothy was full and got caught in a late snow blizzard at the top of Ladhar Bheinn. I still remember when it cleared looking across to Loch Nevis on the far side of the peninsular, a sliver of reflected sky against the dark land that has glinted like far a flung silver coin in my mind ever since. So when I set out to walk into Glenfinnan at dusk with three friends Tim, Andy and Caz last week I felt like I was finally closing a circle of return. Making our way along the dusking road with head torches only heightened the anticipation. Two big days of walking though the wilds lay ahead of us before we could reach the relative comforts of the village of Inverie some 39 miles away through a fortress of towering hills. 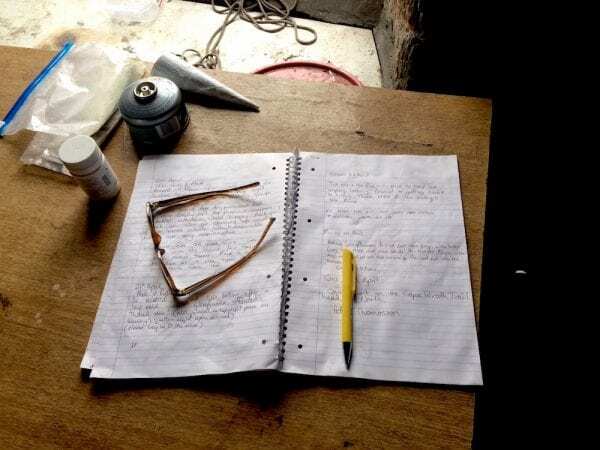 We were given the finest of Highland welcomes at the door of Corryhully Bothy by the young Glenfinnan Estate keeper and settled into a night of fire warmed tales, before turning in for an early start the following day. Unfortunately Andy had a dodgy tummy and decided together with Caz to take the road and ferry round to meet us at Inverie instead. So Tim and I set off up over the pass into Gleann a’ Chaorainn and onto Glendessary forest without them. A final blast of winter had scored the bens white the day before and the morning brought broken sunshine and a keen wind. Apart from the constant threat of ending up in a bog (I fell headlong into one) it was easy going and as the kilometers ticked by so did the last vestiges of our crowded little island. A few houses and dilapidated fencing with a stand alone iron gate gave way to a rough land rover track through woods. 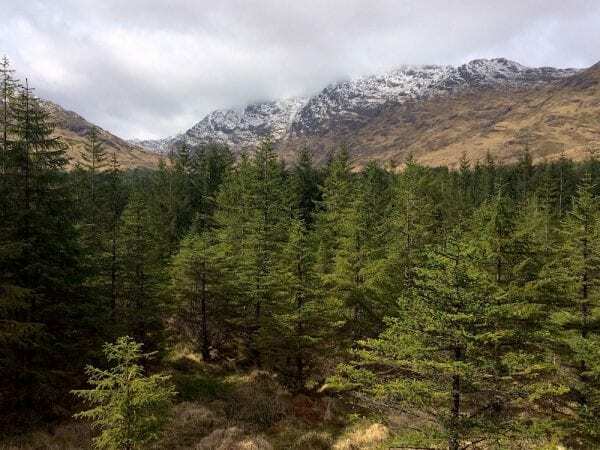 Knoydart was starting to remind me more of the back country of the Rocky Mountains in the States than Scotland. “I clambered downhill through the ugly weather. By the time we finally made Sourlies bothy on the shore of Loch Nevis it was almost nightfall and I had the look of the living dead to me. 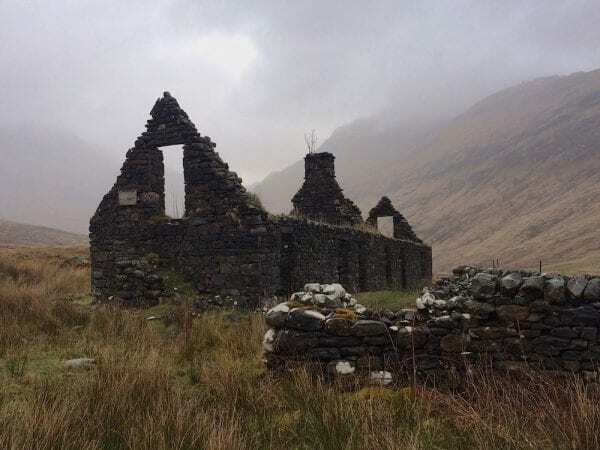 We were met by three other walkers who had settled in hours earlier and looked like they were better acquainted with the rigours of bothy culture. My sense of achievement faded when I learned that they were all separately walking the Cape Wrath Trail and had another 20 days or so to go. The human body has the most amazing ability to heal itself. After 12 hours of dreamless sleep I woke to find I could walk rather than just hobble again. Within a few minutes the jet boil was cooing away and we were all drinking a cup of our Finca Camelia. 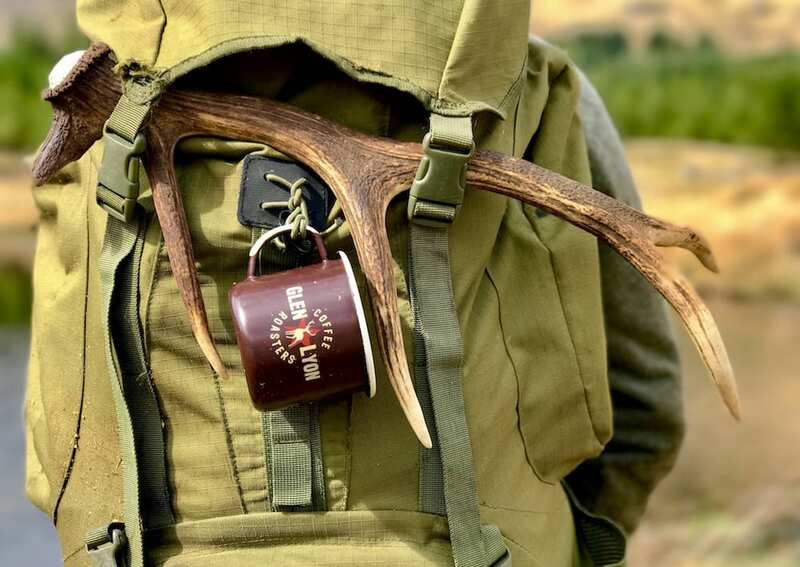 I’ve always gone to the effort of brewing up fresh coffee in the wilds regardless of the extra weight and have never regretted it. Everything tastes so much better on the hill. On the second day of our journey the conditions worsened. The cloud had dropped still further and rain hammered across the Bothy’s tin roof in successive waves. Tim lead, deftly picking his way across the boggy ground around the estuary and up onto the path to Inverie through Gleann Meadail. We paused for a moment to comment on what looked like the remains of an old army barracks from a time when there was a restive population here that the government sought to quell. Look no further for the early days of Britain’s age of empire. Once we had pushed up the switchbacks to the 600 metre mark the route eased and we had a long, gentle descent down to Inverie. We were met on the way down by Andy and Caz who were well fuelled on almond croissants and focaccia from the brilliant Bakehouse in Mallaig. All that remained was night of mouth-watering sea food, beer and darts in the welcoming Old Forge at Inverie. The perfect end to a fabulous couple of days walking. Thanks to Tim, Andy and Caz for your great company. Sitting here now in the comfort of my home I can’t help but think of those guys still out there on the Cape Wrath Trail, walking their silent pilgrimages to Scotland’s wild places. May you all return home safely.